If you are looking for information on the Digital Zone franchise business opportunity, Digital Zone franchises or Digital Zone franchising, then you have come to the right place. 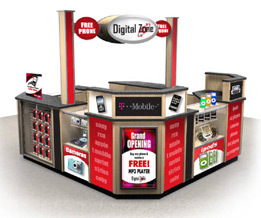 Digital Zone is the nation's only mall based one-stop shop for all electronic and cell phone products. Each store features the coolest international cell phones, T-Mobile service and small electronics including I-Pods, digital cameras, satellite XM radio, portable DVD's, digital picture frames, home theater systems, accessories and much more. We offer top brands at the lowest prices including Sony, Apple, Sharp, Philips, Nikon, Garmin, Canon and Panasonic. Our customers are served by professionals who are extremely knowledgeable in cell phone and electronics. How will I find a good location? Digital Zone has great relationships with the best mall developers in the country. We will jointly choose a mall, find the best locations within the mall and then you will make the final choice as to where we locate. Do I receive training from Digital Zone? Yes! Franchise operators must attend and successfully complete the training program that includes classroom training, local in-store training and on-site support in your store at the time of your soft opening. Do I purchase inventory from Digital Zone? No. You will purchase inventory from approved vendors directly. We use the combined purchasing strength of our chain to effect purchasing economies that will benefit your store and the entire operation. Your earnings capability will depend on a number of factors, such as your location, the amount of time you spend in your store, your business and retail acumen, as well as market conditions. Naturally, as in any business venture, there is no guarantee of your success or profitability. We do, however, give you the benefit of a well-organized system and a concept refined by our many years of experience. The initial term is ten years, after which the agreement may be renewed for additional ten-year terms. We also offer multi-unit operations as long as you meet our financial, operational and management qualifications. We are also looking for people with a willingness to own and operate a franchise to use as a prototype, training center and base of operations for expansions within the territory. Qualified Area Developers will become part of the revenue stream by sharing in the income from both the franchise fees and royalty revenues in the territory. Interested parties should be sales-oriented and will be fully trained in all aspects of the Digital Zone system including franchise sales, construction, ordering equipment and inventory, store operations, marketing and more. It is critical that our Developers establish and maintain an exceptional level of customer service to ensure that each franchisee will consistently deliver the Digital Zone experience. We are as dedicated to finding the right new individuals to join Digital Zone as you are to finding the right business opportunity. We are looking for people with an entrepreneurial spirit who are high energy, ambitious and seeking growth. Digital Zone was founded by a team of professionals that have been in franchising for over 25 years and opened 100's of retail stores! We have been named as one of the fastest-growing franchise companies according to Entrepreneur and Franchise Times and we are currently expanding nationwide! "I never could have done this on my own. I now own 2 stores, have over 20 employees, and I am running a very successful business. In the near future, I will be opening 3 more stores in Phoenix and plan to open up a new market for Digital Zone in Los Angeles, CA very soon." "I have been in the cell phone business for over 10 years in different capacities. I worked retail, wholesale, and for T-Mobile corporate. This opportunity was just right for me. The owners have taught me how to run the business side and I have helped them with the cell phone part of the business. It has been a match made in heaven."